Dr. Smith's diet has been featured on VH1's number-one rated show, Celebrity Fit Club, where Hollywood celebrities follow his customized diet plan and compete to lose weight. 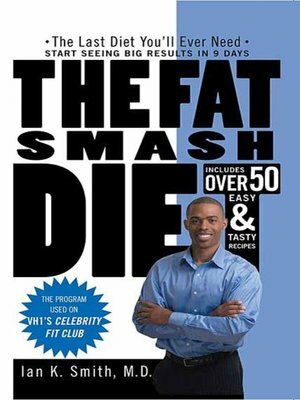 Now, with The Fat Smash Diet, everyone will have access to the revolutionary eating plan that leads to lifestyle changes and permanent weight loss forever. The Fat Smash Diet is not a gimmick or short-term fix. It is a four-phase diet that starts out with a natural detox phase to clean impurities out of the system. Once this nine-day phase is completed, the next three phases encourage the addition of everyday foods that promote significant weight loss. In just thirty days, most dieters will complete all four phases and be on their way to a thinner lifetime of good health. Best of all, there is no calorie counting, and Dr. Smith guarantees there never will be. As an added bonus, there are over fifty easy-to-cook, tasty recipes that make it easier to stick with Dr. Smith's plan. The Fat Smash Diet is unlike any other program on the market. In fact, it's the LAST DIET YOU'LL EVER NEED!